The Mines and Geosciences Bureau (MGB) held the Annual Technical Forum on November 6-8, 2018 in Koronadal City, South Cotabato. With the theme “Mining and Geological Studies are Integral Elements of Socio-economic Development, Environmental Enhancement and Protection, Human Safety and Disaster Preparedness,” the forum was hosted by MGB Regional Office No. XII. Participants from MGB Regional Offices and MGB Central Office attended the forum which showcased and fostered the technical and intellectual capabilities of MGB employees in terms of research and development. The Board of Judges comprised Department of Environment and Natural Resources (DENR) Undersecretary Jeremias Dolino; former MGB Director Mario Luis Jacinto; and the Assistant Dean of the Mindanao State University-Iligan Institute of Technology (MSU-IIT) College of Engineering and Project Leader of PHIL-LiDAR 2, Ms. Ma.Teresa Ignacio. The MGB Regional Office No. XIII delegation was headed by OIC-Regional Director Glenn Marcelo C. Noble along with Engr. Brenice Ann M. Gendeve-Castillo, Chief of the Monitoring and Technical Services Section, and a team of geologists. 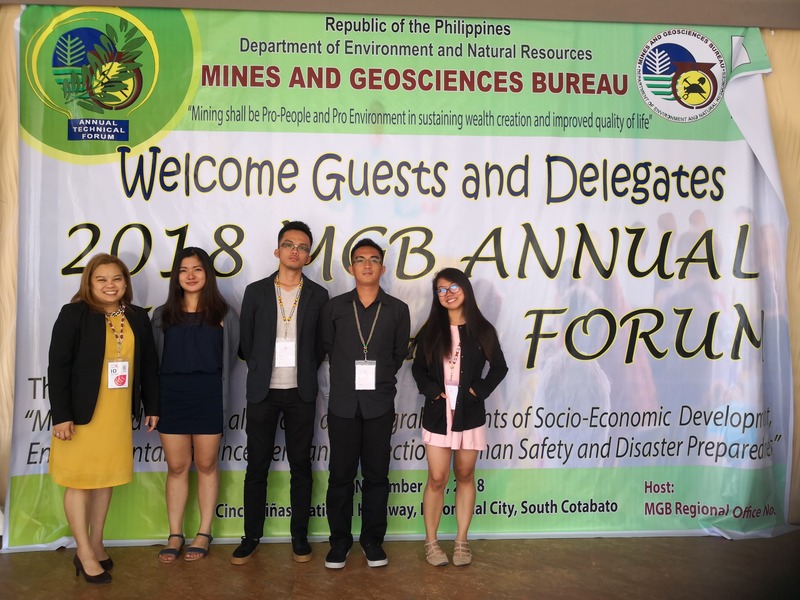 The paper entitled “Spatio-temporal Monitoring of Active Nickel Mining Areas in Caraga using Unmanned Aerial Vehicle and Spatial Analyses,” authored by Ernesto Calzar, Gaius Jabez Galope, Jio Marnn Lendio, Judy Ann Mejorada and Reyana Dawn Garcia, was presented during the forum and competed with eight (8) policy and sixteen (16) technical papers. The research paper aimed to address the need to efficiently monitor the active mining areas in Caraga Region in line with DENR Administrative Order (DAO) No. 2018-19, re: “Guidelines for Additional Environment Measures for Operating Surface Metallic Mines.” Mining companies are strictly limited to a certain disturbed area for extraction of ore which will depend on the scale of their operation. By the use of existing technologies such as smartphones, Global Positioning System (GPS) receivers, Real-time Kinematic (RTK) and Unmanned Aerial Vehicle (UAV) or drone, the team conducted the pilot testing in two large-scale mining companies in the region comparing the instruments used and identifying the upsides and downsides of the equipment. Another entry paper entitled “Proposed Performance Monitoring Assessment Checklist for the Mines and Geosciences Bureau Regional Offices” by Engr. Brenice Ann M. Gendeve-Castillo was also presented during the forum. The event culminated in the deliberation and announcement of winners for the technical and policy categories. The Best Technical Paper was awarded to Mr. Vincent Gascal of Region XII for his paper entitled Preliminary Hydrogeological Assessment of Asik-Asik Waterfalls in Barangay Upper Dado, Alamada, Province of Cotabato and the Best Policy Paper was awarded to Ms. Emma Deverala of Region IX for her paper entitled Institutionalization of the Convergence Area Development Plan: An Engagement Tool for Poverty Alleviation of the Laborer Indigenous Cultural Community in Siocon, Zamboanga del Norte. Ms. Deverala was also awarded as the Best Presenter among the first-time contenders. The Board of Judges commended and congratulated the participants for the outstanding papers that were presented during the forum. Lastly, it was announced that the 2019 MGB Annual Technical Forum will be hosted by MGB Cordillera Administrative Region (CAR) in collaboration with the Mining Technology Division of MGB Central Office.